The Flag restoration has now been completed and on May 21, 2014 The National 9/11 Flag was transferred to the National September 11 Memorial Museum in New York. It is our understanding that the Flag will go on display in the Museum in late spring or early summer of 2015. As additional information is known, we will post it on this web site and other social media venues. 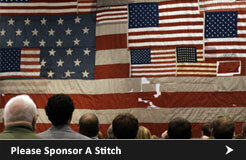 Be a stitch in history and tell us how you felt about stitching or seeing the National 9/11 Flag during the Flag Tour. 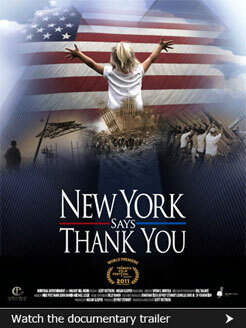 Send your quotes, stories, photos and videos of where YOUR National 9/11 Flag Memorable Moment took place to: Denny@newyorksaysthankyou.org or post them on our Facebook page. Stories already submitted can be found by clicking HERE. The National 9/11 Flag is one of the largest American flags to fly above the wreckage at Ground Zero. It has become our generation’s Star-Spangled Banner. Destroyed in the aftermath of the World Trade Center attacks on September 11 and stitched back together seven years later by tornado survivors in Greensburg, Kansas, The National 9/11 Flag is a living testament to the resilience and compassion of the American people. It has become recognized as a modern day version of the Star-Spangled Banner. It is estimated that over 300 Million Americans have experienced The National 9/11 Flag through national and local TV coverage, public displays in small town gatherings, and major cultural and sporting events. The flag has been stitched by soldiers and schoolchildren who survived the shooting at Ft. Hood, Texas, by World War II veterans on the deck of the USS Missouri in Pearl Harbor, by the family of Martin Luther King Jr., by 20 Members of Congress at the U.S. Capitol, and by thousands of everyday service heroes nationwide. On President Lincoln’s Birthday, a piece of the flag that Abraham Lincoln was laid on when he was shot at Ford’s Theater was stitched into the fabric of The National 9/11 Flag. In May 2011, The National 9/11 Flag was presented as the official flag for The Kentucky Derby and on September 11, 2011, the final restorative patches were sewn into The National 9/11 Flag by 1,067 tornado survivors in Joplin, Missouri. On June 14, 2012 – Flag Day – threads from the original Star-Spangled Banner flag that flew at Fort McHenry in the War of 1812 and inspired Francis Scott Key to write the National Anthem – were stitched into The National 9/11 Flag – thereby completing this amazing historic journey. The goal of The National 9/11 Flag Tour was to display this historic flag at leading venues nationwide, to empower local service heroes in all 50 states with the privilege of stitching the flag back to its original 13-stripe format, and to inspire 300 million Americans with the flag’s rich visual history in order to deepen our sense of citizenship and national pride and bolster the spirit of volunteerism on the 9/11 Anniversary and year-round. As part of the 50-state National 9/11 Flag Tour, wounded warriors, military veterans, first responders, educators, students, community service heroes, and 9/11 family members were given the once-in-a-lifetime privilege of restoring The National 9/11 Flag back to its original format by stitching in fabric from American flags destined for retirement in all fifty states. PHOTO CREDITS: The New York Says Thank You Foundation would like to acknowledge DNAinfo, Julie Shapiro, Billings Photography, Associated Press, Sophia Litchfield and Lisa Dunham of LSD Photos, Diane Soucy of GigaPix, Warren Johnson of LensArt, William Hauser, Jimmy Sands,Denny Deters,Desdaria Delvalle, the Quincy Patriot Ledger, and Wendy Hauser for some of the photos which appear in this website.